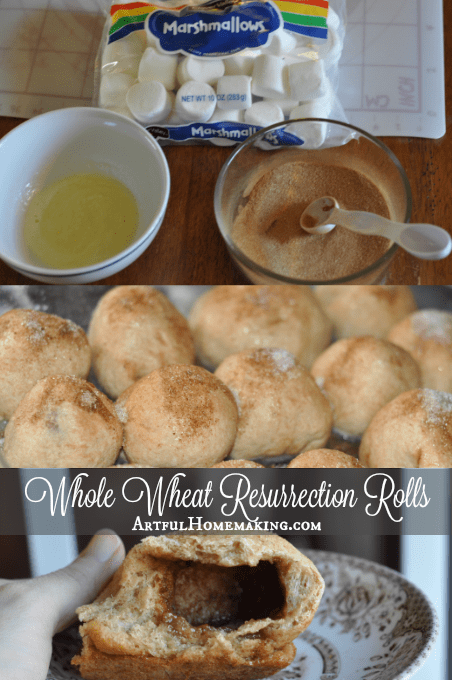 Whole Wheat Resurrection Rolls with the story to go with it. My kids love this Easter tradition! A friend introduced us to resurrection rolls last year. I love that this simple project tells the resurrection story in such a creative and fun way. The recipe calls for a can of crescent rolls to use for the dough, but I decided to adapt the recipe by using my standard whole wheat bread recipe in place of the crescent rolls. And it worked! My whole wheat resurrection rolls take a bit longer than the crescent rolls, and it’s a bigger process, but I figure it’s worth it. We get bread and the rolls out of the batch, so it’s worth the extra effort to me. For whole wheat rolls, follow the bread recipe (or use your own) to make the dough. While the dough is kneading, melt the butter and set aside. 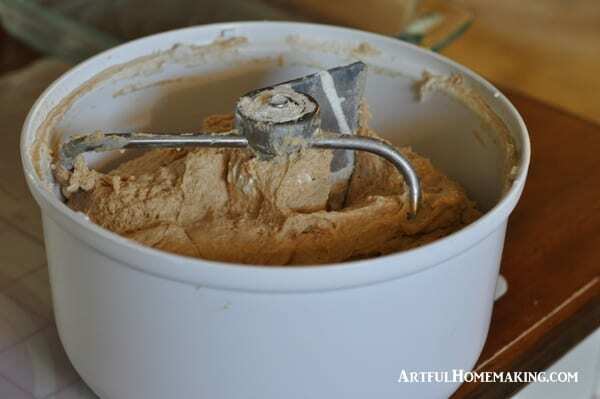 Mix the cinnamon and sugar together in another bowl and set this bowl aside. After dough has finished kneading, pull off a small portion and stretch it out, forming it into a circle in the palm of your hand (if you’re using crescent rolls, just remove from package and unroll them). Explain to the children that the dough represents the cloth that they wrapped Jesus in. Give each child a marshmallow. Tell them the whiteness represents the purity of Jesus, who was without sin. 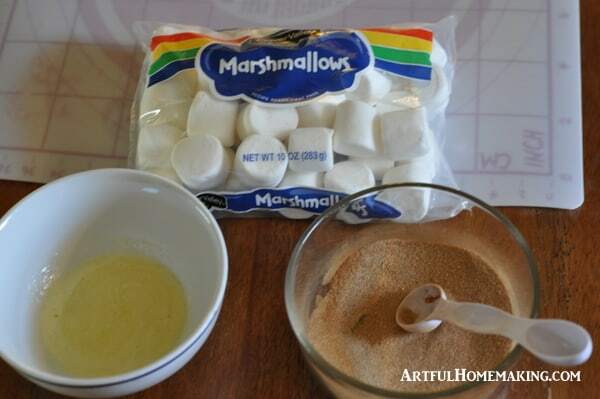 Dip the marshmallows in the melted butter. This represents the oil he was embalmed with after he died on the cross. Roll the buttered marshmallow in the cinnamon/sugar mixture, which represents the spices his body was anointed with. Wrap the marshmallow in the dough you prepared earlier. You may need to reshape it and thin it out some more to make it fit around the marshmallow. Be sure to seal all of the seams tightly, pinching the dough together. Tell the children this represents how they wrapped Jesus’ body for burial. Place each roll on a greased baking pan (I use a 9″x 13″ glass dish). If you used the crescent rolls, place each roll in the greased well of a muffin tin. Repeat the above steps until you’ve used up your dough or made as many rolls as you want. 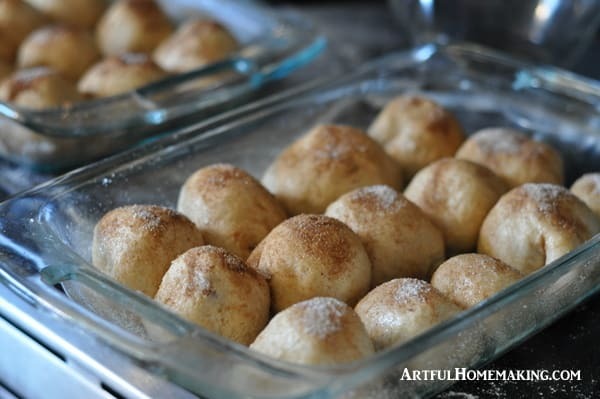 We brushed the tops of ours with melted butter and sprinkled the tops of our rolls with the remaining cinnamon sugar mixture. Bake the rolls at 350 degrees for about 20-25 minutes. (For crescent rolls, follow the baking instructions on the package.) The oven symbolizes the sealed tomb. While the rolls are baking, read John 19-20 together. When the rolls are done, remove the pans to a wire rack to cool. When they’re cool enough to handle, cut one open or break it apart. The marshmallow should be melted, and in its place should be a hollow spot in the roll. The tomb is empty! Jesus has risen! Tell the Easter story in a creative and memorable way with Resurrection Rolls! 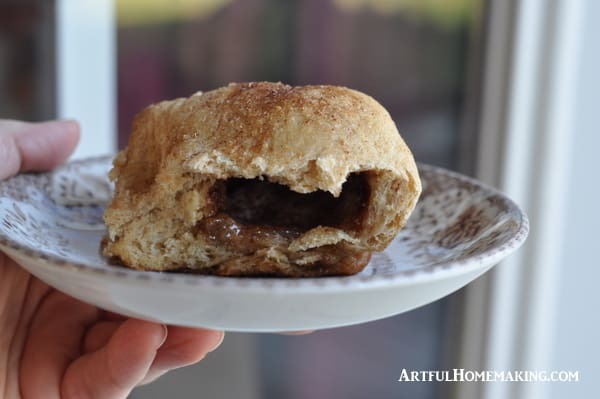 We use our whole wheat bread dough to make it a bit healthier, but you can also use crescent roll dough. After dough has finished kneading, pull off a small portion and stretch it out, forming it into a circle in the palm of your hand (if you're using crescent rolls, just remove from package and unroll them). Explain to the children that the dough represents the cloth that they wrapped Jesus in. Wrap the marshmallow in the dough you prepared earlier. You may need to reshape it and thin it out some more to make it fit around the marshmallow. Be sure to seal all of the seams tightly, pinching the dough together. Tell the children this represents how they wrapped Jesus' body for burial. Place each roll on a greased baking pan (I use a 9"x 13" glass dish). If you used the crescent rolls, place each roll in the greased well of a muffin tin. 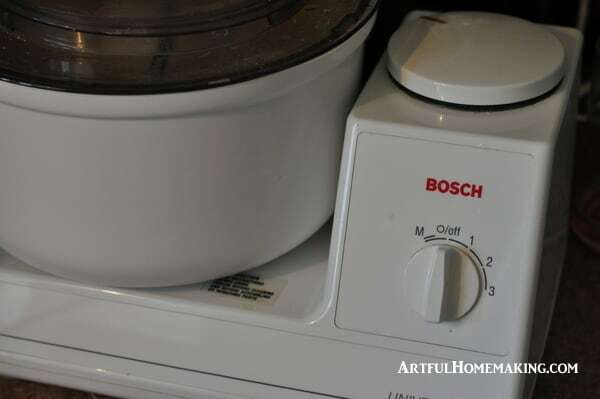 Repeat the above steps until you've used up your dough or made as many rolls as you want. When the rolls are done, remove the pans to a wire rack to cool. When they're cool enough to handle, cut one open or break it apart. The marshmallow should be melted, and in its place should be a hollow spot in the roll. The tomb is empty! Jesus has risen! 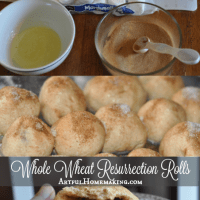 Our whole wheat resurrection rolls were a huge success with my children! This post contains my affiliate links. Read my full disclosure policy here. Sharing here. My Spring Cleaning Plan + Free Printable Checklist! I bet my boys would love these too; they do typically enjoy anything with marshmallows. Pinned. Marshmallows are a huge hit around here too! Thanks for sharing on the Homestead blog Hop. I hope we see you there again today. Resurrection Rolls are such a powerful way to illustrate the story of Easter to children. They are really tasty too. Thank you so much for sharing your recipe and the story with us at Hearth and Soul. Hope to ‘see’ you again this week! Thanks for hosting the link-up, April! 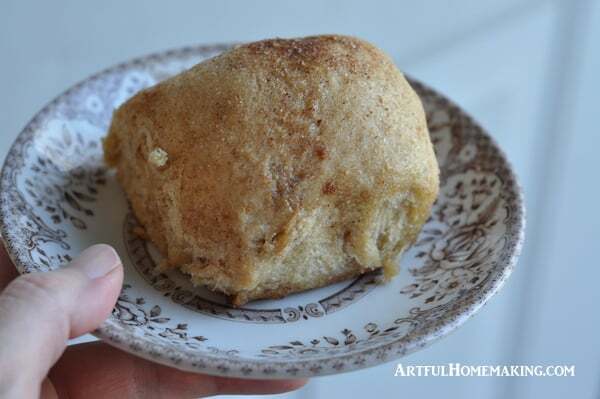 Joy – I loved making Resurrection Rolls with my kids when they were little. The are so easy, and also delicious. Thank you for sharing the whole wheat version today. I am your neighbor at #FreshMarketFriday Easter Blessings to you and your family. So glad you stopped by today, Debbie! And thank you so much for the invitation to your linkup! 🙂 Hope you have a lovely Easter weekend! These are so neat! I think I will make these for Easter breakfast YUMMY! oh my goodness, that is too cute! 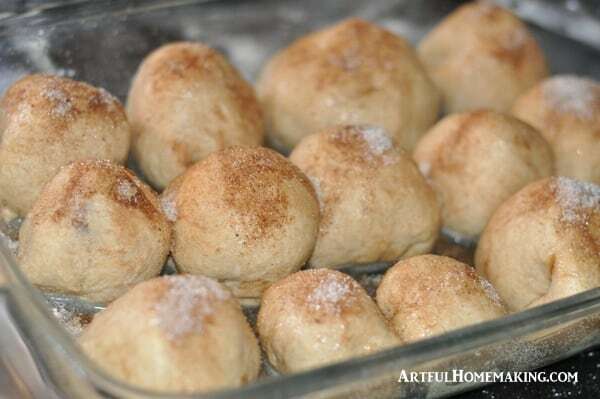 I don't have any kids, but I want to bake those rolls for myself because they sound so yummy!